Vanilla glass will not change, but it will be much better if you often use several glass panels or blocks connected together. 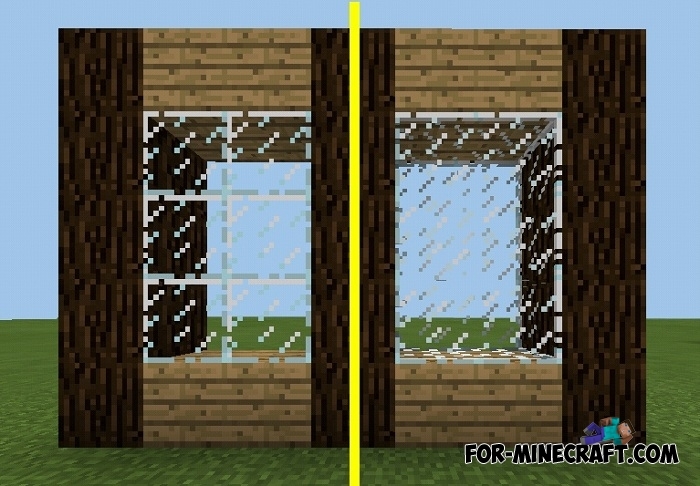 The Fancy Glass mod does so that glass blocks or panels lose the inter-block frames, thereby large glass windows and other glass structures will look several times better. Just compare the look before and after installing this modification. As you can see, the side frames remain in place, but the interblock ones are removed which gives you the opportunity to build huge stained glass windows with a better appearance. Fancy Glass runs on Inner Core, which means you can additionally install it to IndustrialCraft PE or any other IC mod in MCBE. How to install Fancy Glass? What is with these codes??.??. ?.